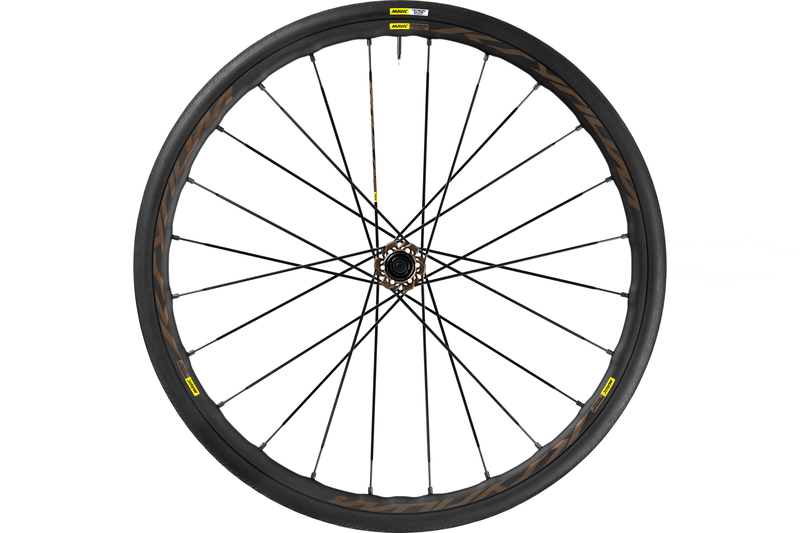 The popular Mavic Ksyrium line has been updated for 2016 with tubeless compatibility, discs and wider rims. The original Mavic Ksryium wheel is 16 years old and through that time Mavic has been at the forefront of aluminium clincher design. Last month Mavic released its updated Kysrium Elite but from July, the iconic French brand will have eight wheelsets, with shoes and clothing all falling under the ‘Ksyrium’ label. With the UCI testing disc brakes in races later this year, the road disc revolution seems inevitable, but less certain is the type of axle that will become the industry standard. To future proof the new wheels, Mavic has hedged its bets, with triple compatability. The new wheels come with adaptors to ensure they work with 15 and 12mm thru axles as well as quick release skewers. Also new is wider rims. The road bike wheel sets feature an internal rim width of 17mm and the rough road wheels have a 19mm internal width. This is in line with the recent trend for wider rims which allow the tyre to sit wider, providing superior comfort and rolling. With gravel bikes making their way across the pond, the Ksyrium Pro Allroad Disc is designed for bad surfaces, such as gravel, dirt and pavé as well as smooth tarmac. Ideal for those who want ride on tow-paths, bridal ways and roads alike. You can see the Pro Allroad Disc in action in the video below. The internal rim width of the Allroad Disc is 19mm, and is designed to accommodate 30mm tyres, with Mavic claiming that it is best suited their own 30mm Yksion Elite Allroad tubeless tyre, that comes with the wheel. The tyres weigh a reported 320g with sealant adding roughly 40g per wheel. Also featuring new hubs, the Kysrium free-hub has a nine-degree engagement, which is claimed to be an improvement over the previous 17 degree engagement on the current Ksyrium wheels. The allows for a quicker pick up. The bearings are said to be better protected from water and dirt too, with an improved seal. Availabilty in the UK is expected to be around September. The problem with carbon clinchers is that the rim is point of weakness. It has to withstand the outward force of the tyre bead and the inward pressures of braking. In addition, braking creates heat which can build up, causing delamination of the wheel. While this may not be a problem on rolling roads, long descents, particularly in the wet, have the potential to cause serious issues. To counter this Mavic have included an aluminium insert into the rim of the Pro Carbon SL. This technology was first seen the Mavic Cosmic Carbone 40C, with the new wheels featuring a wider internal rim than the predecessor. The aluminium insert adds a small amount of weight (~80g), but Mavic is adamant that the inclusion is crucial to make the Pro Carbon SL clinchers more durable and practical than the competition. 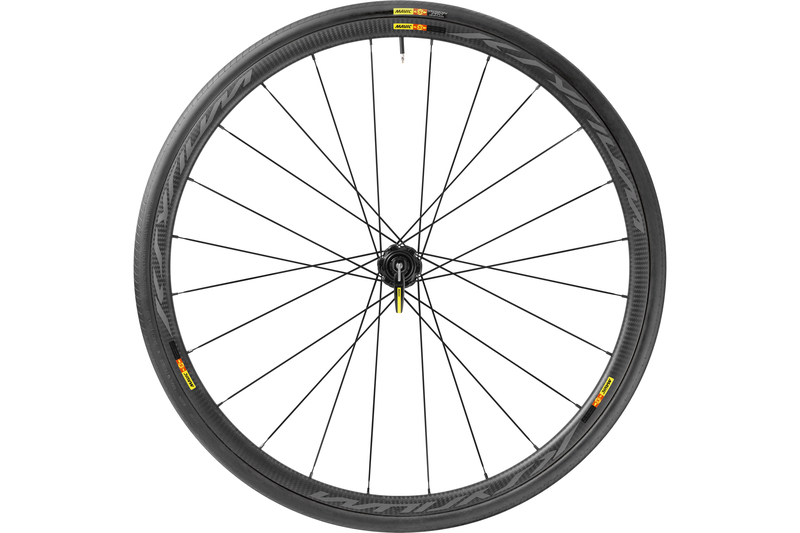 The carbon rim also features Mavic’s TgMAX braking surface. Mavic claims this treatment results in superior performance, reducing stopping distance as much as 48% better rival wheels. With 24 spokes rear and 18 spokes front, the claimed weight for the clinchers, is 1390g a pair, while the tubular version of the Pro Carbon SL is a featherweight 1190g a pair. Disc wheeled versions will have a few more front spokes and be slightly heavier. Pricing will be £1350 for the clinchers and £1450 for the tubular versions.